Fostex’s new VF-16 digital multitracker doesn’t just re-write the book on all-in-one digital multitrack solutions, it rips it up and starts again. 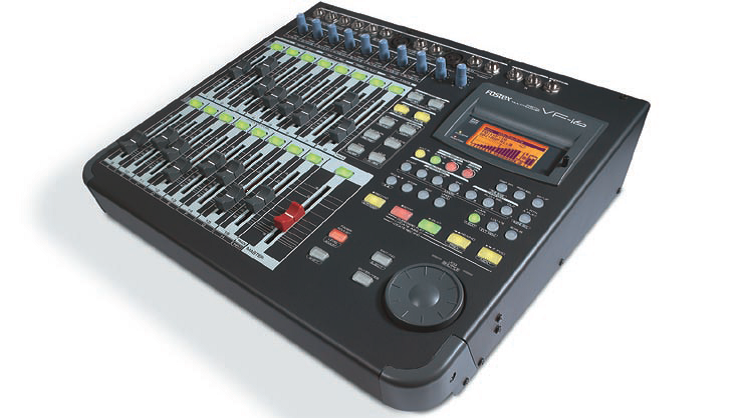 Here is a machine which combines state-of-the-art hard disc based 16-track digital recording with supreme quality digital mixing and houses it in a rugged, easy to use, package. But that’s just the start of it. As usual with Fostex, this little baby is not only packed with stellar features it’s simplicity itself to operate. The VF-16 features no less than 24 tracks with simultaneous 8 track recording, (16 when using ADAT interface) to an internal (user upgradable) E-IDE hard disc. And having those extra ‘ghost’ tracks gives you real flexibility. For example; you’ve recorded a great guitar solo, but want to try another to see if you can improve the performance - no problem, just use another track for the new version. With this type of power you can record different versions of vocals, different drum grooves, different guitar parts, then choose which of the 16 tracks you wish to reproduce and mix. Once you’ve experienced this kind of flexibility it becomes a necessity. •Direct Mode - If you want to record 8 inputs simultaneously to 8 recording tracks, this mode routes the inputs directly to the digital recorder via trim pot, bypassing the mixer. •Buss Mode - Alternatively you can record multiple inputs to 2 recording tracks using the digital mixer to set levels, EQ, effects, etc. This high specification machine records true CD-quality uncompressed digital audio. Naturally, as the VF-16 uses a digital non-linear recording system, full Copy, Paste, Move & Erase editing with Undo & Redo is achievable. Ease of editing is aided by the ability to display scrubbed audio graphically, making ’on-the-fly’, intricate edit points simple and intuitive to designate. Plus, with clipboard data available to be pasted to the same, another, or multiple tracks and automatically repeated up to 99 times, you can become a re-mix wizard in a matter of minutes. And if you thought that was cool, wait ’till you hear that the VF-16 can export and import audio (all tracks, one track or any part of a track) as standard ‘.WAV’ files via SCSI, meaning that editing, processing and sound file conversion can be accomplished using popular PC music software. The amazing audio quality delivered by the VF-16 is due only in part to the stellar recording engine. The digital mixer also has a role in making the VF-16 the most usable, best sounding multitracker out there. Firstly you get some real 60mm faders to play with on all 16 input channels and master. The ‘distortion and hiss-free’ input stages (including 2 with XLR, inserts and +48v phantom power), feature trim pots and have been designed to handle almost anything you can throw at them from the lowest of low level mic signals to the hottest instrument signal. There’s a great 3-band EQ with parametric mid & high on all 16 channels to enable you crisp up, add punch, cut hiss or increase the depth of your sound. There’s also a separate EQ for the master, assignable channel compressors (ch 13 + 14 or ch 15 + 16 with EQ off), & master compressor, 2 AUX sends per channel for adding external effects, a monitor out with level control and handy insert points on inputs G & H for adding compressors, limiters, etc. Plus, a stereo mixed source can be digitally transferred to an external digital recorder thru S/P DIF. With the 100 mix scene memory, you’re not tied into one mix either. Entire mix scenes (include effect parameters), can be saved and recalled - you’ll never loose that perfect EQ setting again. And, as the scene sequence mode allows for the automatic recall of mixes programmed into a scene event map, you’re not even tied to one mix per song! •MIC/LINE trim pot on all analogue inputs. Input G & H feature balanced XLR connectors, phantom power and insert points. Peak LED is provided on each input. The removable plate on the underside of a VF-16 allows you to change the internal E-IDE hard drive. A larger hard drive means more recording time. A.S.P. is a unique digital effects processing technology newly developed by Fostex. By combining a special Harmonics Feedback Algorithm with Hi-Density Logarithmic Processing, A.S.P. effects offer higher gain in the early reflection characteristic and are free from the ‘grittiness’ associated with lesser technologies.